Since I wrote my first post which was a humble attempt which lasted no more than a paragraph or two, this could be my shortest post in ages. We underestimate the experience and judgment of a cook. She has great estimate of when the oil is hot enough to throw in the pulses and leaves to roast the garnish for the “Daal” or some “Sabji”. Mothers don’t use any measure to judge how much rice to use or “Aatta” to knead to cook for four people. It is sheer experience and sound estimate. A cobbler has spent years knowing how to push in the broken toe-holder strap and hammer those nails down and with which size of nails and hammer to use. It’s the daily magic in our lives that we simply refuse to see in front of our eyes. These daily, unnoticed miracles in our lives can be summed up as “measure twice, cut once” as Stephen Covey would put it. PM Modi measures every word he speaks for impact. Arvind Kejriwal words every measure that he purchased. AK got media folks as his tailors who got all his measurements badly wrong. They dressed up him in the “emperor’s new clothes” – Naked as hell, with only fraudulent limp bizkit to show for it. They measure the whole of India with the little Delhi Dicks, Blonde and Harried. And the results are predictably bad. A fraudulent “Scambag” like Kejriwal, planted by forces that are anti-India gloated a bit too much for the public to swallow. Sometime back, the street-thug and monkey-balancer Rajdeep Sardesai grandly claimed in a speech in Pune that before launching the IAC movement, Kejriwal and Kiran Bedi came to him for advice. They wanted to agitate in Mumbai with Anna Hazare against corruption. Rajdeep claims credit for advising them to blast a bomb in Delhi and not in Mumbai because Delhi would get greater media coverage and political attention. He was tactically right. IAC and Kejri did get the mileage from the bomb-blast. The best description of this pathetic, psycho Kejri came through Twitter. A non-performing CM of a senior municipality like Delhi was lecturing the nation on every damn thing. Not a day passed when Kejri didn’t abuse Modi or his opponents. He RTd the worst morons and the worst abuses hurled at Modi. A mere Twitter CM with no portfolio, Kejri had the swagger of a Viv Richards with neither the talent nor the extraordinary skills that Richards possessed. A planted dumpling of foreign forces that want to destroy India, Kejri was only interested in border-states or coastal states like Goa or Gujarat. Avarice would be a better term, instead of Arvind. Avarice Kejriwal! And all the greed is nothing except for money and working for anti-India elements. He has no agenda, no goal, no mission. We owe a small debt to Punjabis for junking this weed. We owe the biggest debt to Goans for thrashing this anti-national to his nakedness. If Kejri still wants to sell his poison in Gujarat – we are ready. Punjus and Goans are fun-loving people. Gujjus don’t even care about governments. But one thing for sure – Gujjus hold extraordinary contempt for scamsters and thieves. They hold contempt for rapists and kidnappers. Most of all Gujjus don’t like anti-Hindu gangs. I should know a bit about that. Avarice Kejriwal is a dog in the manger who wants India to fail. He even wanted to campaign against BJP in UP although AAP wasn’t contesting the elections there. His media supporters like Barkha, Saba Naqvi, Sagarika, Rajdeep, Shekhar Gupta etc. have smoked him and now lie in disarray. India is doing fine. Scumbags like Kejri will die a natural death in our new politics of performance. Kejri is everything that is wrong in our country today. An elected leader cannot do much damage but him being forever present on MSM and his opinions pushed down people's TV screens can cause a lot of harm to the general people of this nation. What a hatred filled statement. But factually Avarice Kejri deserves it. Listen to what ever Modi said during Delhi elections carefully about Kejri. It was beyond my compression how the educated Delhiites did not read it between the lines.He is an anarchist who doesn't mind swearing on his children and then lie. In US I found out if people know that one lied they brand him as a lair and don't believe him or her. Delhiites are as dirty & polluted as Delhi.Biggest brokers. No surprises if they choose him again.For cheaters (Majority of Delhiites) ,who follow no ethics or any principles , Kejri suits them perfectly.First thing Modiji shd do is to change the capital to some where in the central India or in the Deccan side. Incredible. I liked reading. But I do not like such extreme views. You have probably missed this place has been epicentre of India as nation. Gateway to India. And undergone lot over thousands of years. Extreme views? —Extreme situations warrant radical solutions. Great observations and analysis of the TERMITE #shri420 UNGLIBAZ CM without Portfolio. The worst part is, this scamster is still in office and not in jail like the Chornia gang, PUCCA CHOR family and AP. Their saviours should also have been in jail but for a benign PM. Or a backroom deal is on to save the nation looters in spite of single minded pursuit by @Swamy39 to nail these nation looters. actually we shud thank pujabis and goans for making him a ration card!! Kejrival is needed in Indian politics to set examples and draw comparisons. Surely we must thank people of Goa for peeling off AAP to its core. 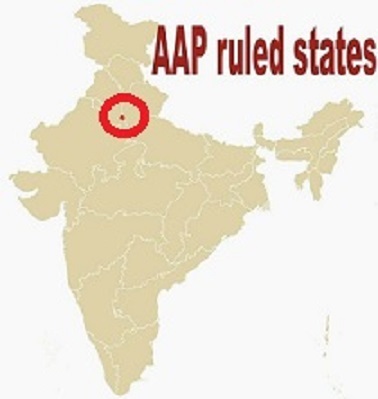 Punjab has still given reasonable votes to AAP. Delhi is a miracle disaster. But this fellow Kejriwaal has psychiatric issues...he needs psychiatric medications as well as psychological counselling. He is a puppet in the hands of the "Breaking India" Program run by the East India Company. These are the neoage liberals. They want India to become like the European Union. No one can sum this danger si succinctly and concisely as this. But this should happen not just in Goa and Gujarat.. Buy in every state where he even chooses to tread. Gujarat as usual now carried a huge responsibility of thrashing this scum si roundly that he won't even think of venturing in Odisha.. Distinctly remember when Anna Hazare started his IAC with this Kejri as right hand there was a big Bharat Mata picture as background.But not much later this picture was unceremoniosly removed by Kajri gang and a sterile banner was put up.His mission became destroy Modi than anti-corruption.He went to Gujarat to expose Modi,Then followed him to Ganga for a dip.Corrupt Italian Christians were given up.Like the idiot Rahul G he also aimed straight at PM's chair.Now he is rolling in riches from Khalistanis,Islamists,Xian agents forgot all about anti-corruption. May be short, but very sweet...Very apt description of the Gandhi Suvar, as some one said...Sure that the Gujarati ppl will trash him even more than the Goans.. Excellent post sir. The cheerharan is complete. Hope he values whatever respect is left of him and quits instead of grandstanding. The nation will treat it as a bad dream and move on. You have the charlatan down to a T. And his MSM supportrs... bah! Bunch of soulless goons! Once we had a king who had no clothes on but no one dared tell him, but her problem is we have two kings, Arvind & Rahul, who are without clothes, they know it but probably believe that this gives them more publicity than if they well dressed. Politics apart,i have great deep felt sympathies for his family who have to tolerate this mutated mental called avarice kejriwal. Kejri has been very accurately described and the charlatan has been thoroughly exposed.Kudos to @media crooks. There's a certain uniqueness in Mediacrooks articles which even when being in an extreme attack mode brings out facts with clarity and conviction. Many of us would love to write a stinging article that hits the nail on its head, but I'm afraid most will end up with rants and abuses without as much as presenting the facts. Here's where Mediacrooks excels with his well-informed mind that uses the pen to deadly effect to make mince meat of his preys and their pimps - generally anti-nationals. Pranams. If anybody is still wondering, how such shameless scamsters are established and thrive, you have to examine the unfortunate history of Delhi. While Delhites were being raped, killed, converted, robbed in last few centuries, anti people, anti national experts were ready to serve new masters, new invaders with their knowledge of local terrain both physical and mental. Pea brained Kejri saw an opportunity of becoming himself sultan in vacuum created by demise of Congress, to loot wholesale then to remainng a mere pimp. All said and done HE HAS INVITED THE CURSE OF AN OLD HONEST GENTLEMAN CALLED ANNA HAZARE. Never underestimate the Baddua of the elderly!!! This outpouring of anguish is fully justified.Man is an evil incarnated .So far as Gujarat is concerned, BJP should welcome his and his AAP.It is Congress that should be worried.Let him come and split Congress votes.That will enable BJP to win 150 seats as planned. How media paints India as a rogue state. I think they do it to subotage the make in India drive. Request: you should also start exposing these international media. I mean you have done it before, i know. But i think it is needed again. May the truth prevail. Dear Ravi, excellent as usual and caustic too and rightly so. Rest assured about Gujarat, we hate anti nationals to the core. And good thing with Gujarati people is that they can recognize the junk even if it is wrapped in a fancy package. Kejri is trying to pack his junkie agenda in Gujarat in some new packages and some of them are lethal for our society such as instigating communities for reservation etc. But I have trust on collective wisdom of gujarati people. That's a insightful article. Have the same feeling. I am sure people of Gujarat will respond like Goa.